We had a great time at the Ethiopian Restaurant ‘Eetcafe Ibis’. For starters the café was themed in a typical Ethiopian way where beer was served in Coconut shells. They had a variety of Beers-coconut, mango, palmnut, banana flavored. We had samosas for starters which was similar to indian Samosas! Mostly flavored I have not tasted in any cuisine. The non vegetarian itemswere similar to the Khasi tribal food of North east India which is boiled with fat. Deserts were delightful. We were served coconut icecreams in Cocunut shells , lemon icecreams in a lemon and Pineapple icecream in a pineapple. Amsterdam never ceases to amaze me. Not in my wildest dreams had I imagined such an event with this intensity. Thousands of people came together on Dam Square for the year’s most massive pillow fight on April 2nd. We went there with our Cameras to capture the event but soon started picking a fight with Pillows. The event began at 3 PM . When people had bought pillows and started hitting each other politely. Soon it became frantic and there were feathers and cotton in the air. There were torn pillows on the floor and people were refilling them with cotton to hit each other. People were dressed in carnival costumes. It was a joyous event and we has fun. It was choking after a while the cotton and feathers entering your windpipe. I took some breaks and got back into the arena this time with goggles. It was the most crowds I had seen in Dam square since I came here- People of Amsterdam fighting and a row of tourists filming the event. In the other side of dam square were artists performing and some dressed up in comic costumes. The same choreographed songs were to be performed in 10 countries- 17 cities on 19th March. 2016, 11- 12:00 Local time in each country participating! Amsterdam was one of the participating cities and out motto was “One Love” in support of refugees. It was an amazing concept and it was to be a surprise flash mob with no publicity. The Amsterdam group led by Sneha, were practising it for over 2 months in our ‘Bollywood Amsterdam meetup’. We were fully prepared for the moves of the choreo which will forever be struck to our heads. We met for a practice session at Vondelpark at 10:30 AM. We got a spot under the bridge and switched on our speakers. We had practised indoors but never out in the open when the temperature was 7 degrees. We wore colourful bright clothes to make the atmosphere radiant. We took off our jackets and did a real practice (We were shivering!) .We had audience cheering us for our trail flash mob which was encouraging. The clock struck 11 and it was time to go to Museumplein. It was the famous spot ‘I Amsterdam sign’ in front of the Rijksmusem, the biggest museum in Amsterdam. It was buzzing with tourists. We were the intruders who would break in to dance in front of the museum :D. We set up the speakers and switched it on. Martine, our show opening performer, started her ‘Head spinning stunt’ which caught the eye of the audience. We casually started cheering around her and then started dancing. First the girls danced for 2 minutes and then the guys joined us. The sad part for us was there was not a representative videographer filming us from our side. We set up two cameras on the tripod which were blocked by tourists. We did click some after photos which came out cool.It was a thrilling experience performing a dance out the blue and startling people. We rejoiced our victory of completing it successfully and then left to Saravana Bhavan. It was delight having south Indian food after a heavy day. Our Dutch collogues enjoyed the food but found it a bit spicy I think :P.
If you happened to be among the audience on march 19th or heard about it in some way,please share your thoughts with us! Maastricht’s carnival is one of the joyous and fun events to visit with friends and family. Dutch sure know how to party! . The first day of Carnival is six weeks before Easter Sunday. Carnival officially begins on Sunday and lasts three days -Typically February first or second week.Almost everyone dresses in some weird, outlandish, colorful, funky costume that you will feel out of place if you are dressed normally. You can see babies and dogs dressed for the carnival. And a man looking like a colourful ostricht. In the same frame you can see a superman kid , green lantern and a minion baby! We had a great time and will definitely go the Next time too! The Bollywood Amsterdam group which I am a part of planned on performing to the ‘ABCD Vande mataram song’. We had 17 days at hand and we managed to concoct a partly jazz, hiphop and Bollywood dance show. The costume was plain white shirt and black pant to keep it simple. The venue was Amstelveen –the Indian Hub of Amsterdam. The organization “Bridging the gap” organizes these Indian events which provides a good get together and means of networking for Indians in Netherlands. We sensed kindergarten vibes when we entered the building. Much to our dismay there were only kids performing at the show and we happened to be the only adult dance team. We were stocked up as the last and closing performance of the day. The initial performances were of kids singing slokas, cute children dressed in Indian wear dancing for Punjabi songs and even some dutch kids dancing. The room was clamorous with occasional bursts of cry from kids and parents rushing them out. It was time for our performance!! On the whole the dance seemed energetic and patriotic. The final show with flags turned out to the killer. It came out just as planned and we got a round of applause. Indian bites organized small canteen with tasty indian snacks. We got around and took some pictures and went to a friends home to party. It was my first new year outside India. I wanted it to be crazy. 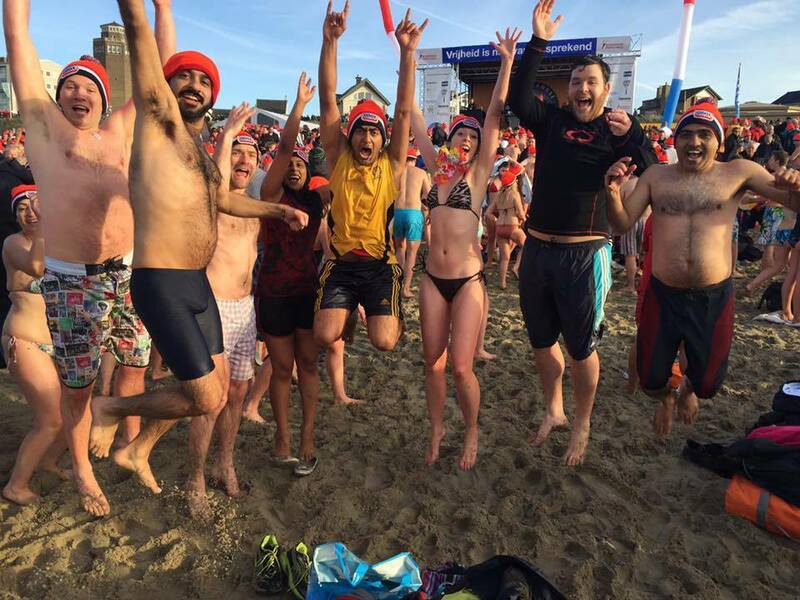 We decided to do the ‘New year dive’ –the dutch tradition of jumping into the icy cold waters of the north sea at New year Jan 1 noon. We signed up for it and went to Zandvoort for it. It did not disappoint us :D. The day was sunny and the beach was refreshing. There was a tent and a bunch of people standing with orange caps. We too went, registered and got the orange caps. 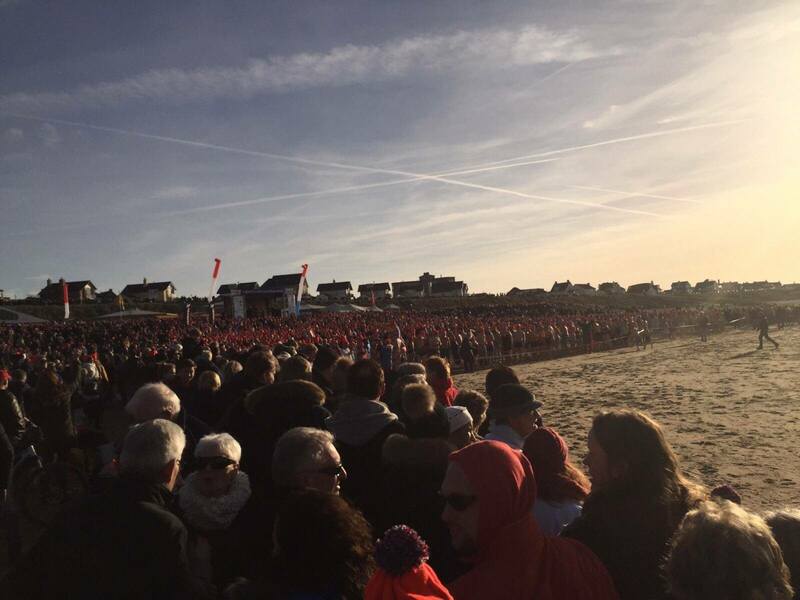 There were about thousand people gathered for the event. We were stunned by the magnitude of it. I had planned of doing the dive with a bunch of friends and they all arrived. We got ready for the dive-changing into our swimsuits! There were people of all ages- yound kids to old people and also dogs who came for the dive. 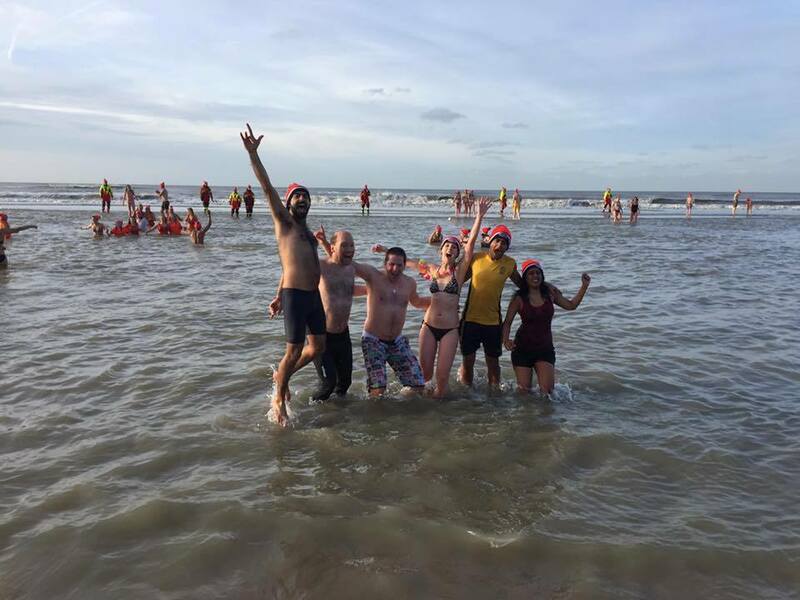 Half an hr before the dive organizing team cheered us to dance, jump and making us form a Mexican wave. The clock struck and it was time! People ran like crazy into the waters. Just when I went in I realized I had never exposed myself to such cold waters in my life. It was freezing and I could not feel my legs anymore. We ran back to the sands from the water. It was the case with most of the people. We came back to the starting point and tried regaining consciousness in our legs. It was crazy. Just when we were settling down one of us challenged to go in again. We , out of our minds, ran again into the waters. This time, deep and dancing and jumping inside the waters. That was something to remember. We came back and got dressed. Unox ,the sponsoring company , provided us with free soup. We returned back to the city searching for a cozy café but alas we could not find any. We finally gave up on our search for café and went into a greek restaurant. Ten of us were there and we socialized for sometime. It was a nice beginning to the new year!